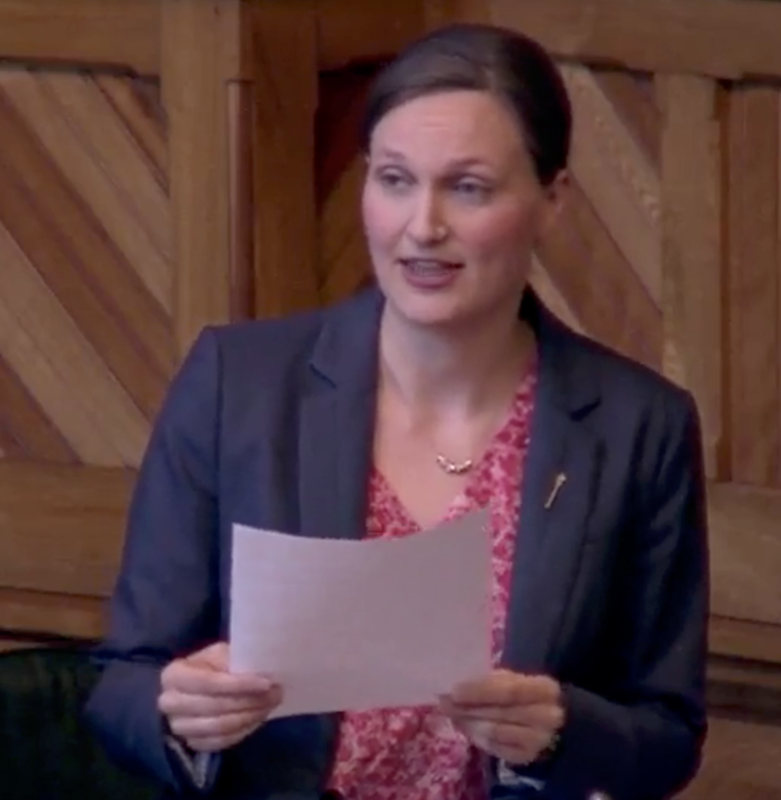 MLA Megan Mitton took opposition to a proposed rock quarry in Westcock near Sackville to the floor of the New Brunswick legislature today. During a short members’ statement, the MLA for Memramcook-Tantramar pointed out there is already a quarry in the area. Mitton added that residents have lost wells and sustained cracks in the foundations of their houses. Mitton also noted that controversy over quarry development is not new to the province, but neither the previous Liberal government nor the present Progressive Conservative one have taken steps to implement better protections for local residents. “We were promised change and I know the residents of my riding would like to see it,” she concluded. Earlier during a telephone interview, Mitton said she met with Westcock, British Settlement residents yesterday to hear their concerns since she wasn’t able to attend the community meeting held last week at St. Ann’s Church Hall. She noted the widespread opposition to the quarry with people writing letters and signing a petition against it. “It’s not about being anti-business, but we can’t be open for business at any cost,” she said. “One of the first things that did occur to me was what type of environmental impact assessment or other version of that would apply here,” she said, adding that she told the residents she is planning to raise the issue with the minister of environment and local government. Mitton suggested that people who live in unincorporated local service districts or LSDs need a greater say in how they’re governed. “Local residents, even when they stand to be really severely impacted, don’t have a lot of rights when it comes to this,” she said. Meantime, Bowser Construction, the Sackville company proposing to open the quarry off British Settlement Road, is still not returning calls. Bowser received conditional approval for the quarry from the Southeast Planning Review and Adjustment Committee on January 23rd. This entry was posted in Environment, New Brunswick politics, quarry, Westcock and tagged Bowser Construction, local service district, LSD, Megan Mitton, quarry. Bookmark the permalink. This is a piece of good news, regardless of the outcome. Thank you MLA Megan Mitton. MLA Mitton certainly is dead on with her plea to the Provincial Government to act NOW on this issue where the contented lives of citizens can be so dramatically turned upside down with the whim of gouging out the countryside and putting a large rock blasting pit operation basically anywhere a construction company wants to. This is NOT a simple gravel pit. Our Provincial representatives, the SE Regional Service Commission, seem way more interested in making sure that a few pet goats are evicted from Dorchester, or a couple of pet horses are booted out of Salisbury, than they are about the well being of the common citizens. They did give unanimous conditional approval for this rock pit in a residential area even though they stated that they did not know if it was even legal for them to use that 20 ft right of way. Glad she is standing up for the concerned citizens over this issue, which I think is important. Wish she had stood up for our business and our employees. We have been forced to cut shifts and hours as a result of the decision she made against our business expanding. Guess it didn’t matter enough for her? Not once did she ever reach out to myself or Wendy on how she could help our business in any way, nor support it! Can people improve their decision-making when we they are removed from the influence of a (toxic?) group? I so much would want to believe so. This is why, like you, I salute our MLA’s advocacy for the concerned citizens. Personally, I also appreciate that she focused this time on a LOCAL (and URGENT) concern. Percy Best said it so well: this matter requires action NOW. This being said, without wanting to turn the knife in your wound, I personally still feel sad for your business Mr. Alder. Town Council did not want to support it over and over (for unknown reasons). I also know at least two other citizens who may have had frustrating experiences. One of them is an excellent entrepreneur. The other citizen— well, I happen to know him personally (as my soul mate :)). Anyhow, I will not name these two citizens now. They will recognize themselves, if they will read my comment. Plus, the past is behind us, although “those who cannot remember the past are condemned to repeat it” (words of George Santayana). Let’s jut say that we have acknowledged her good job and we are grateful, even if we remember the past (just to keep a perspective on matters). Good luck to our fellow citizens. To conclude, I will repeat myself: Thank you MLA Mitton. Please make sure your remember that ALL Sackville citizens’ voices count, even those whose neurons are not fully coated with a thick green colour (Who knows? I may be one of them :)).